Abstract: We present a fully automatic method that finds a small number of machine fabricable wires with minimal overlap to reproduce a wire sculpture design as a 3D shape abstraction. 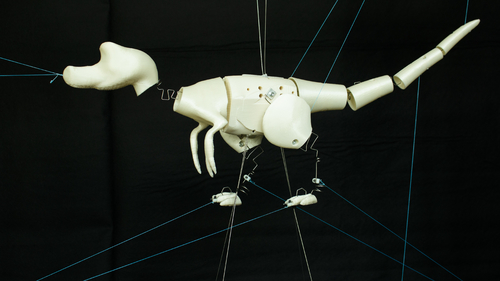 Importantly, we consider non-planar wires, which can be fabricated by a wire bending machine, to enable efficient construction of complex 3D sculptures that cannot be achieved by previous works. We call our wires Eulerian wires, since they are as Eulerian as possible with small overlap to form the target design together. Finding such Eulerian wires is highly challenging, due to an enormous search space. After exploring a variety of optimization strategies, we formulate a population-based hybrid meta-heuristic model, and design the join, bridge and split operators to refine the solution wire sets in the population. We start the exploration of each solution wire set in a bottom-up manner, and adopt an adaptive simulated annealing model to regulate the exploration. By further formulating a meta model on top to optimize the cooling schedule, and precomputing fabricable subwires, our method can efficiently find promising solutions with low wire count and overlap in one to two minutes. We demonstrate the efficiency of our method on a rich variety of wire sculptures, and physically fabricate several of them. Our results show clear improvements over other optimization alternatives in terms of solution quality, versatility, and scalability. Abstract: Elastically deforming wire structures are lightweight, durable, and can be bent within minutes using CNC bending machines. We present a computational technique for the design of kinetic wire characters, tailored for fabrication on consumer-grade hardware. Our technique takes as input a network of curves or a skeletal animation, then estimates a cable-driven, compliant wire structure which matches user-selected targets or keyframes as closely as possible. To enable large localized deformations, we shape wire into functional spring-like entities at a discrete set of locations. We first detect regions where changes to local stiffness properties are needed, then insert bendable entities of varying shape and size. To avoid a discrete optimization, we first optimize stiffness properties of generic, non-fabricable entities which capture well the behavior of our bendable designs. To co-optimize stiffness properties and cable forces, we formulate an equilibrium-constrained minimization problem, safeguarding against inelastic deformations. 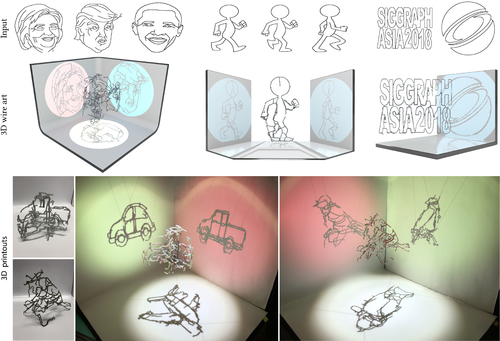 We demonstrate our method on six fabricated examples, showcasing rich behavior including large deformations and complex, spatial motion. 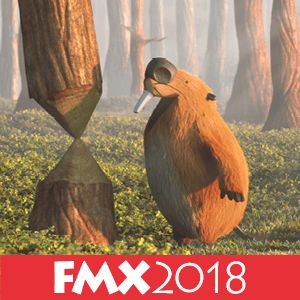 Abstract: We propose FlexMaps, a novel framework for fabricating smooth shapes out of flat, flexible panels with tailored mechanical properties. We start by mapping the 3D surface onto a 2D domain as in traditional UV mapping to design a set of deformable flat panels called FlexMaps. For these panels, we design and obtain specific mechanical properties such that, once they are assembled, the state of static equilibrium matches the desired 3D shape. FlexMaps can be fabricated from an almost rigid material, such as wood or plastic, and are made flexible in a controlled way by using computationally designed spiraling microstructures. Abstract: Wire art is the creation of three-dimensional sculptural art using wire strands. 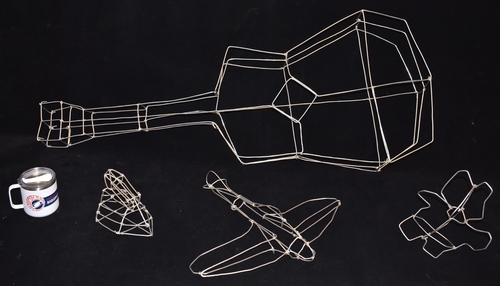 As the 2D projection of a 3D wire sculpture forms line drawing patterns, it is possible to craft multi-view wire sculpture art --- a static sculpture with multiple (potentially very different) interpretations when perceived at different viewpoints. Artists can effectively leverage this characteristic and produce compelling artistic effects. However, the creation of such multi-view wire sculpture is extremely time-consuming even by highly skilled artists. In this paper, we present a computational framework for automatic creation of multi-view 3D wire sculpture. Our system takes two or three user-specified line drawings and the associated viewpoints as inputs. We start with producing a sparse set of voxels via greedy selection approach such that their projections on the virtual cameras cover all the contour pixels of the input line drawings. The sparse set of voxels, however, do not necessary form one single connected component. We introduce a constrained 3D pathfinding algorithm to link isolated groups of voxels into a connected component while maintaining the similarity between the projected voxels and the line drawings. Using the reconstructed visual hull, we extract a curve skeleton and produce a collection of smooth 3D curves by fitting cubic splines and optimizing the curve deformation to best approximate the provided line drawings. 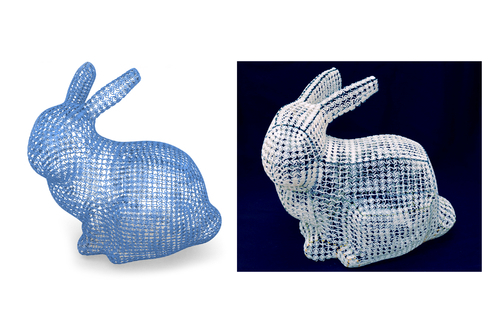 We demonstrate the effectiveness of our system for creating compelling multi-view wire sculptures in both simulation and 3D physical printouts.